How do you achieve a more painterly impressionistic approach with acrylics? In this series, I will be posting a weekly video lesson that you can follow along at home. It’s free to subscribe to the blog to receive updates so you can keep up with the painting progress. The first technique in mastering an impressionist style of painting is in the actual name itself, ‘Impressionism‘. We are trying to achieve an ‘impression’ of the subject, rather than a detailed copy, so squinting your eyes at the subject, to blur the details is one of the first tricks to adopt. The image below can be ‘right clicked’ and ‘Save image as’, so you can use it as a reference. To better illustrate the Impressionist technique and speed of painting I am using a more extended palette than I would usually recommend for painters just starting out. The acrylic paint colours I use during this tutorial, are modern equivalents to the paint colours used by Monet. Some of the exact pigments he used are no longer available and replacements have been man-made out of a combination of pigments to replicate the original colours. When a modern paint colour has been developed to replicate a historical colour the word ‘hue’ is used on the tube, for example, ‘Cobalt Blue Hue’. This is not to be confused with ‘hue’ – as in a colour’s hue, for example ‘that colour has a red hue‘. I appreciate it can be hard not to confuse them as they are the same word! But ‘hue’ when used on a paint tube, indicates that the pigments used in the paint mixture are a combination. Step 1 – Use a coloured ground. From the Old Masters to Monet using a coloured ground is a technique that is often forgotten in the art room. It helps to take away the glare from the white of the canvas and gives you a mid-tone to paint onto. The technique is so easy to implement and will rapidly improve your painting almost instantaneously – It’s number 1 in my painting principles. For this demonstration, I’m using Yellow ochre. Monet would have usually used a more muted ground colour but for the choice of image we’re working from this seemed to fit the bill. 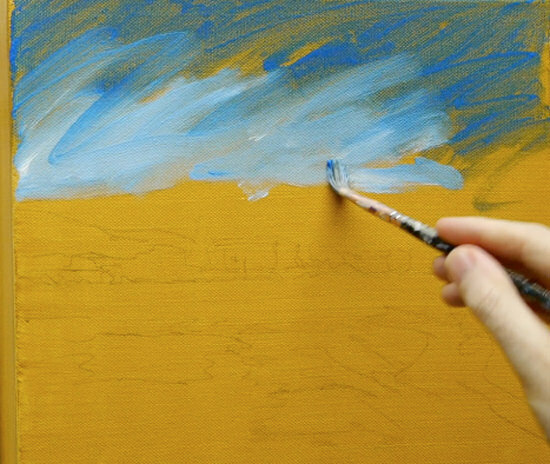 Simply apply a watered-down mix of Yellow ochre onto a pre-primed canvas or board. You can read more about the benefits of a coloured ground, there is also a video demonstration on how I apply the coloured ground below. The next stage is to draw out the basic shapes in the piece. As this demonstration is more of a study of impressionist techniques rather than an exercise in developing a more finished composition you don’t have to spend too long on the drawing. I use a 3B pencil to roughly sketch in the main shapes. I then lay out my colours onto a tear-off palette. If you want a bit more working time with your acrylics then you can set out your paints onto a stay-wet palette. There is a video tutorial below on how I would usually set out my colours on the stay-wet palette. Monet often began with a rapid blocking in of the colours, as he was working within the constraints of daylight. When painting subjects ‘en plein air’ the colours in nature can change very quickly as the sun moves position throughout the day. The lower the sun is in the sky, the warmer the light, with sunrise and sunset having a warm colour in comparison to the cool blue light of north light. Monet seemed to favor this warm light as it gives such a rich variety of tones in one scene. Some of the light techniques he was trying to achieve only lasted for less than 10 minutes, so we have to work quickly! We are using a hog hair brush so we can move the paint around quickly and easily, it will also enable you to add thicker, impasto paint in future lessons on this painting and be closer to the materials he would have used with oil paint. Using Cobalt blue hue and water, I add a very loose watery wash to the top of the sky. I’m just trying to establish some basic colours in the piece. As the sky becomes lighter towards the horizon I add Titanium white to lighten the mix. During this process, I’m painting very quickly using gestural marks and I’m not concerned with getting it spot on, it’s a case of getting it on there and getting a feel for the painting. The mountain has 3 simple mixes, you can see how it changes from left to right. The first mix is Cobalt Blue Hue and Titanium White which I paint in with a thicker mix than the sky. I then mix a turquoise by adding the permanent green light to the cobalt blue hue. I blend these colours ‘wet into wet’ and add more of the green to the mix as I get to the left-hand side of the painting to indicate an impression of trees. When this colour is mixed I scan the reference image for any examples of this colour appearing in the foreground of the piece. This helps to unify the scene and give a movement of colours throughout the painting. 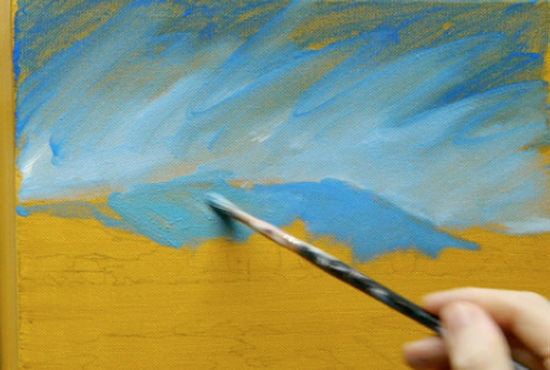 I use short strokes to apply the paint slightly more impasto (thicker) than the initial wash in we used for the sky. These dabs of colour help to move the viewer’s eye around the painting. I then add Cadmium Yellow Medium and a touch of Titanium White to the mixture to vary the tints slightly. 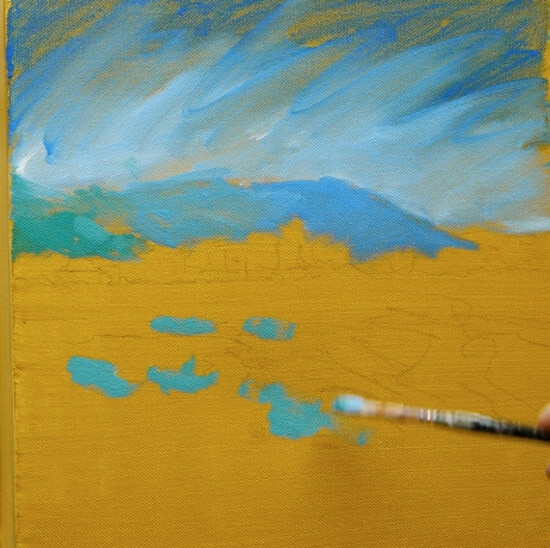 This video below shows the first steps I take to start the painting process of this impressionistic landscape painting. Next week, for Part 2, we’ll start to add the violets to bring the lavender to life and add some warm colours to the foreground. Many thanks for sharing your high quality videos. It’s very helpful to see your working method and how a painter actually gets the paint onto the canvas – this helps me loosen up my style. I like acrylics because they can be worked so rapidly although I find that oils are more subtle. The one thing that frightens me is filling the weave of the canvas and getting that horrible ‘plastic’ sheen effect. I’ve resorted to methylated spirit and sanding to get rid of it! That’s one reason I like working on MDF/hardboard because if things go wrong I can sand the (dry) painting down and paint over. Once again, thank you for your inspiring website. Thanks for the comment, hope the video helps you loosen up your style. You are awesome. I have a BS in art and I love the way you teach solid principles. Thank you. You’re welcome Jacqueline, pleased you’ve been enjoying the lessons. I am loving the tutorials that you do. I just found it today. Hoping to see you next one! Thanks very much, looking forward to seeing how your painting turns out. Looking forward to your next video. Thanks for the excellent lessons. Very happy to have watched this video and looking forward to the continuation. It’s actually quite refreshing to watch a green being used straight from the tube rather than mixing it! Thank you for the time and trouble you go through in making these wonderful videos. It’s very much appreciated. Thanks very much, yes a subtle use of pre-mixed green can be used to good effect. Glad you’re enjoying the videos. Great lesson and very cheerful image. Thank you. Monet is a great painter to study, if you ever get the chance to see his work in the flesh, the L’Orangerie in Paris is awesome. Hey Will! Where is part 2 of this tutorial? I’m left here suffering with a bad case of tutorial interruptus. Seriously, I love your tutorials and i am anxious to see the next vital step here. You are an alive Monet,you gave spirit to him and his works and let the would see the small details of his work.We are watching Monet once more in our time,by teaching,the hardest way for you and the easiest way for us to get his feeling .You are a genius too. Thank you for posting these videos. I have been a painter for most of my 70+ years, and since it becomes more difficult to find instruction at a reasonable price and close to home………..you are a breath from heaven. I will begin my own Monet style painting in the morning! Thanks again. Thanks for your kind comments. You’re welcome, hope you enjoy your Monet painting! Okay! I’m caught up to the end of video tutorial #2. Now as I sit and look, I think I did too many small dabs and more dabs over those. Your painting has much larger painted sections than mine in comparison. Is that okay or is the idea to have really large paint strokes and very few smaller ones or are smaller ones okay as well? I also have to fix my sky somehow as I now have no other colors left other than the various blues. arg. Seems my underpainting in the sky is gone. It’s all okay though, I’m learning a lot! Thank you thank you for your tutorials, I’m loving it. Pleased to hear you are enjoying the tutorial, small dabs are fine. I usually work from larger dabs to smaller dabs so you can adjust the tones and hues of the painting as it progresses, rather than feeling you need to alter the mood of the piece but have an army of small dabs to contend with! I LOVE this lesson and style of painting. Thank-you! I can’t wait to try it! I would be very interested to see how you would teach how paint in a style of Monet, or impressionist painting using a water scene. Would you use all the little strokes of varying colour in the water? I often struggle to paint water in an interesting, loose way…especially when the water is in the foreground. Painting water would be using a similar approach with the little strokes adding a variety of colour. I would probably start with a watery underpainting first and then paint the more impasto dabs of colour ontop. Once again Will, you have shown another avenue to we, the unwashed, in this Monet series which I just came across! It is so exciting to we who struggle, to see how easily you create…surely a challenge to select, and teach something that we will be able to grasp, after an appropriate amount of attempts, and practice. I had no idea what a genius looks like, good sir, but you certainly fill the bill !! Thanks, my man. brush pushers! Best to you on this lovely day in B.C., Canada . Thanks for the glowing response, I’m flattered! Good to hear the Monet series is helping with your painting inspiration. 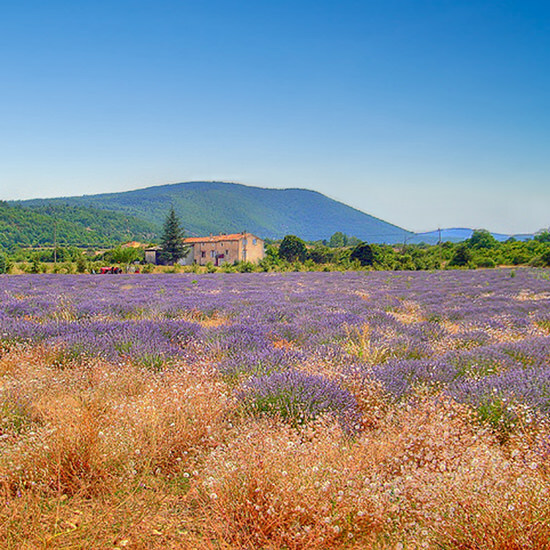 Once your move is completed enjoy the tranquil scenes of a french landscape. 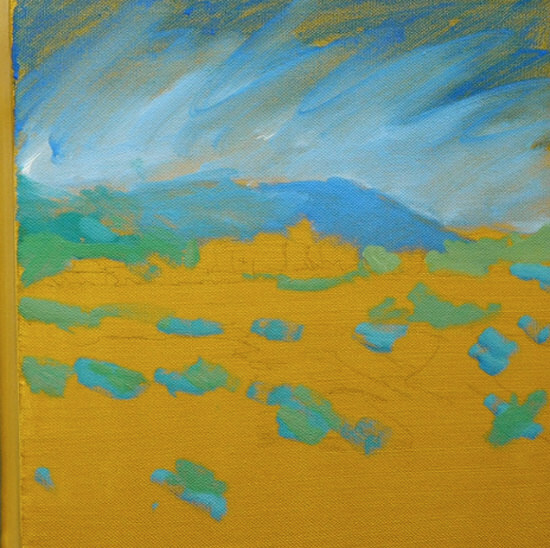 1) Does my 12×12 canvas have to be primed (with gesso) before painting the color ground in Yellow Ocre? 2) I live in a small town without a decent artist’s grade supply store. I’m wondering if I can use Cobalt Violet hue and Alizaren Crimson watercolor paint straight from the tube rather than purchasing those colors in acrylic online? Sort of as an experiment? I’m loath to get too invested in acrylics until I decide for sure that’s the direction I want to go. What do you think? 3) I’ve noticed some words popping up that I don’t understand such as Golden Heavy Body, Gold Open – what do they mean heavy body vs. any other kind of body? And open? What? 4) What do you think of Fluid Acrylics? and Interactive Acrylics? Since I am just starting to think about acrylics I wonder about interactive acrylics especially. And I’m not sure about fluid acrylics? Do you have opinions on these for a very new beginner? Thank you so much Will. I am so thrilled to have found you!!! Thanks for dropping by, great to hear you are going to give acrylics a try. 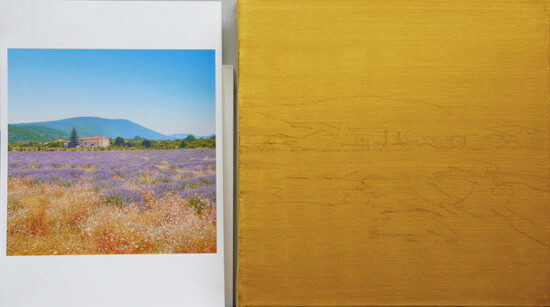 1) Does my 12×12 canvas have to be primed (with gesso) before painting the color ground in Yellow Ochre? It doesn’t have to be primed with gesso, but I would reccomend it. 95% of ready-made canvas already has been primed with gesso. For a thick, impasto effect this won’t work as you will need to use sooo much of the watercolour. Also, the amount of water will behave differently with watercolours and acrylics, just something to be aware of. You can experiment with acrylics with a couple of colours untill you feel confident that they are the right direction for you, they won’t damage each other, so it might create some interesting results! Worth a go! Golden ( Heavy Body) The ‘Golden’ part is the manufacter name, the heavy body part just denotes the thickness, heavy body has a consistency similar to oil paints. Golden ( Open ) is a range of acrylic paints that stay wet longer that standard acrylics, the ‘open’ relates to the term ‘open time’ or the ‘time before the paint dries’. Standard Acrylics have a short open time, ‘open acrylics’ have longer, oil paints have longest. Fluid acrylics just have a thinner consistency, handy if you work in a more watercolour style rather than oil painting style. I’m going to have my mid-semester test this month so I’m thinking of making impressionist painting. For the brush, do I have to use the hog hair brush? or do you have alternative brush to use? really pleased to hear the tutorials have been helping you learn about traditional painting techniques. You don’t have to use a hog brush, a synthetic brush designed for acrylics would also work,(I use Isabey Isacryl) the filbert shape is best, but if you can’t find one try using a flat brush. You make it look so easy….looking forward to giving it a try! Have always wanted to paint but never knew how to start. Thanks so much, it really is easy! Looking forward to seeing how your painting turns out. Will, thank you sssso much. Your work is breathtaking ( If i can say so in English). So glad to have found your site – I really like the way you teach and admire your style. While your Monet is fantastic… your palette is equally so! I see a flock of brightly coloured parrots! Great and awesome site. Thanks for sharing your knowledge in painting:) . Just found your blog today. I am new to painting can’t wait apply the knowledge. Keep it up and more power. Thanks for dropping by, so pleased to hear you’ve been enjoying the site! Hi Will. I stumbled onto your YouTube videos by accident. What a discovery! I’m a beginner painter with 3-4 pieces under my belt. You gave me confidence to give this project a whirl. I have all the color except for Cobalt Violet Hue to get started. I’m unable to find that. I do have Dioxazine Purple. Can I make that work? DP seems cooler than CVH. What are your suggestions? Hi Dave, yes a few students have had the same issues tracking down cobalt violet hue, Here are a couple of other Cobalt Violet Hue alternatives from different brands, they are all mixes as I haven’t tracked down another exact match to the Golden Acrylics version. Alternatively you could add a touch of either Quinacridone red light or Permanent alizarin crimson to your Dioxazine purple, you’ll be very close. Hi Will. Thanks for your reply. You are making a difference in people’s lives. Keep up the grand work. p.s. I would love that Van Gogh tutorial that you mentioned elsewhere. Hi Dave, good one, so pleased you had a go at the Monet style painting. As you’re new to painting I think you’re done really well. There is a nice balance of colours throughout the painting, and the layering of the different hues in the purples work well. For your next painting you could easily go a bit thicker with the paint to enhance a few areas of the colours. Really hope your wife loved the gift. My sweet heart ( my husband) is a good singer, by the way. Hi Monika, the green I use is called Permanent green light (from Golden paints) which is close to a Emerald green. Usually viridian is a darker blue/green and not as vibrant as the permanent green light. If you already have a Viridian you might just need a brighter green or just add in a touch of cadmium yellow light. enjoyed the lesson very much. I have been doing a lot of portraits and now experimenting with a transparent type pallet- My big question is the mountains in the back- You seemed to have painted them so much lighter- I am struggling w getting values down especially from photos- I can’t get out w all my stuff to paint and have to rely on Photos- On book said to go to photoshop and take the shadows in adjustment down to 25% instead of the 50% they usually have it set at- I thought this was good advice- I assume it is more artistic they way you did it- It just seems so much lighter to me than the picture but look great. For sharing with all of us.Thanks for take your time and explaining slowly how to do it,very helpful . good health and good luck to you. Cheers Gena, pleased you enjoyed the lessons. You’ve totally blown me away sir. It’s my first time to meet an artist who has unselfishly shared his talents. Watching your videos is tantamount to enrolling in an expensive art school. If the student watching is really interested it’ll be enough to start to paint. And learn the rest from personal experience. Hi Staedler, really kind of you to say so. An understanding of the basic principles of painting can make a massive difference to a students progress, and gain the confidence to paint solo! Looking forward to seeing your results from the tutorials. This is really beautiful, thank you with your help with our paintings. I really loved the Cherry Still Life lesson, Do you think you may in the future show us how to do other still life such as apples, they are really hard to do. Happy to see all your lessons. Thanks Virginia. really pleased you enjoyed the cherry tutorial, I’ll add your request to the list! I just found your website today & have spent the whole evening watching your videos. It’s really great to find your tutorials. I’ve watched lots that assume that you know some basics (which I don’t). Thank-you so much for these resources. I’m quite new to painting, and thus, am the proud owner of a number of acrylic “starter” sets. I was sorting through them looking for the colours mentioned in this tutorial. I have a “system 3” green, called emerald, it looks pretty close in colour to the one in your tutorial. Do you reckon it would be OK? I also have a “daler rowney basics” called violet, which again looks pretty close. Any ideas if this would be OK? Those two colours will be perfect for this demo, do you have any artist quality white? as for this demo we build up the layers of colour on top of each other, so having that extra opacity form the artist quality paint will make a huge difference. Thanks for your reply – after watching a number of your videos, I went out and bought artist quality white. You are correct, it does make a difference. Do you think other artist quality paints are worth the expense? I was thinking about replacing my other colours gradually as I use them up. (my budget (and husband’s nerves!) won’t handle replacing them all at once. Hi April, pleased you are finding the artist quality white is making a difference to your painting. A gradual approach to adding artists quality paint is a worthy investment as you’ll always get better coverage and opacity. You’ll notice the biggest difference in the whites and the yellows. I loved this demonstration. It fired me up to use this technique and thank you so much for the pleasure of the mystery it leaves one with and that freshness. Thanks for dropping by, really pleased you enjoyed the Monet lesson and its fired you up to create! Hey Amy, thanks for the comment, great to hear you’ve been inspired to paint! Using this technique with flowers would work equally well. Enjoy the painting. I’ve been putting together my supplies for the Monet-type painting and am having a very hard time coming up with PERMANENT Alizarin Crimson and Cobalt Violet Hue. Can you suggest what colors you might blend to mimic a Permanent Alizarin Crimson? I did see that you did a combination of Quinacridone Red, Ultramarine blue and Titanium white for blending a copy of Cobalt Violet Hue. So, I’ll try that one. Any suggestions on the Permanent Alizarin Crimson? It depends on what existing colours you already have, but if you have a standard Alizarin crimson then add a touch of Quinacridone red to it, this will help to mimic the brighter pinks you can achieve with this colour. The Permanent Alizarin Crimson is only available from Winsor & Newton, in both the Galleria and Artist acrylic range. Thanks once again, Will. I will try what you said to do. I did look in more than one store for the Winsor & Newton, and they had everything BUT the Permanent Alizarin Crimson…Oh Well!!! It will give me the opportunity to use one of your great suggestions on blending colors!!! Have a great day, Will!!! Cheers Mary, isn’t that always the way! Just found your site. It is wonderful. I have always loved impressionists’ paintings. I am a beginning oil painter. Do you have a site that deals with oils rather than acrylics? Hi Ann, pleased you’re enjoying the site. I don’t have a specific site for oil tutorials, however, many of the techniques I demonstrate are based on classical oil painting techniques so would equally apply when working with oils. I have already learned so much from your tutorials – thank you! I noticed that you use water a lot to thin out the acrylic paints. 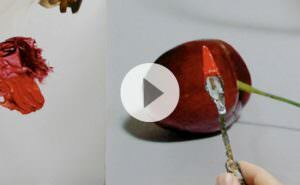 On other videos I’ve seen, art instructors warn against using water and recommend using mediums instead to keep the painting from peeling or flaking off the canvas. What is your take on this? Have you ever experienced this with your paintings? I sincerely appreciate you sharing your expertise and look forward to your videos. So pleased you been enjoying the lessons, if you notice my use of water in the paintings that the most watery layers are usually applied on first application of colour to the canvas. If I then use thinner applications of paint in the final layer of a painting I mix the colour with Acrylic glazing liquid. I have never experienced any peeling, or flaking off the canvas with any of my acrylic paintings. iridescent and glowing. I have a hunch that the base is lead white. Any thoughts? This same green is in one of Latrec’s paintings-the one with the green faced lady at the left hand corner of the painting-looks like she is in a bar or at the Follies. In the painting Woman with a Parasol – Madame Monet and Her Son it looks like a mix of Viridian and Cadmium yellow light. Monet did use Lead white in his paintings, also French Ultramarine, Cobalt violet and occasional use of Vermillion. You are one of the greatest teachers. Your videos have inspired me to try to take my paintings to the next level. Color mixing has been a problem for me in the past, but your video has made it simple for me. Thanks for sharing your talents and skills. Great to hear it Estelle, thanks for your kind comments. Thank you so much for this amazing lesson. You’re welcome Maryam pleased you enjoyed it. Where do I get the “Monet” landscape image. I could not see the download option on the page. Hi Phillip, the reference image is at the top of the article, just ‘right click’ it on your mouse to download. I find your instruction very clear and ‘cheery’ as well. Hearing your “good morning class” start off the class always gives me permission to step away from the heaviness of my work and life. Thanks to you and Vanessa. Hope your keeping well, thanks for your kind comments and glad to hear you’re finding time for your paintings. In this instance the word ‘hue’ denotes than a different pigment was used rather than the original pigment, so instead of using a pure cadmium pigment (which is expensive) manufactures create a colour that is close to cadmium red but use more affordable pigments to create it. But those paints will be fine for this tutorial. Hi Manijit, pleased you’ve been enjoying the painting lessons. Great to hear it Kay, really hope they enjoyed the lessons. I am a 15 year old amateur artist and your insight into the impressionist style has really helped to develop my technique. I really enjoy the works of Monet and his is an artistic style I usually adopt if I am to paint. With these videos you have created, you have really made me understand the style and processes needed (and reminded me I had ran out of Cobalt Blue!). I shall definitely be watching more of your videos as you offer the clearest artistic explanations I have seen. Hi Andrew, pleased to hear you’ve found the tutorial helpful in developing your Impressionistic painting style, and great to hear you’ve found the tutorials clear to follow. Thanks Angelina, hope you enjoyed the tutorial. I can’t wait to give this one a try. I didn’t have very much luck finishing the acrylic landscape for beginners. I started out okay and even went along alright but somehow I just couldn’t pull it together. Perhaps I ought to do it over but I think I’d rather try this one in the meantime. You are so talented. I hope someday to have atleast some of your talent. thank you a ton for sharing all of your knowledge. You are a wonderful human for doing this. Thank you thank you !!! I look forward to the next video. 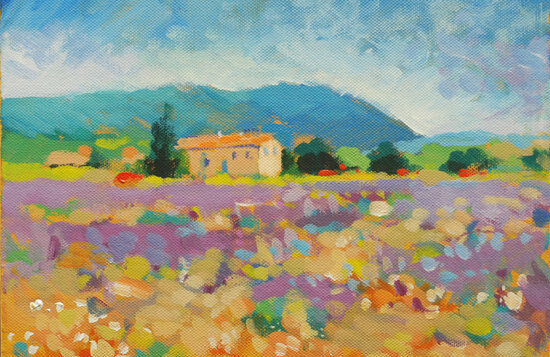 Thanks for your kind words Jeanine, hope you enjoy the Monet painting lesson. i was looking for “how to paint impressionism with acrylics”, I was having problems following the lessons, that is until I found your videos, you explained everything in easy to understand words, I just hope it is as easy as you make it look, as painting impressionism is my next project. Thank You for posting the videos, I look forward to seeing more of you videos. Good one Kevin, great to hear you’ve found the lessons easy to understand and follow. Thank you for being so generous and willing to share your knowledge allowing hundreds to access the joys of painting. I’ve never been particularly good at art, but then again, it’s never been explained and demonstrated as simply and effectively as you have managed to do with your tutorials! I think you are a wonderful teacher, I’ve watched all of the videos and have bought one of the course videos too. I cannot wait to get started at painting, your videos have inspired me greatly to pick up my paint brush :) I am bed bound and have a condition affecting the brain and spinal chord, so my aim isnt great! So thats why Ive decided to start with the impressionist style painting. It seems to be more forgiving if I suddenly aim drastically wrong! So my art things and table top easle have come in the post today, and are being bought to my care home later by Mum and Dad and I cannot wait to get going. The carers are looking forward to seeing what I paint too, and they’d like me to paint something for their hallway :-) We shall see how I get on! I can’t wait to get going, and I shall let you know how we get on! Thank you for your videos Will, if it weren’t for them, I wouldn’t have had the confidence to give this a go. Hey Kara, so pleased you’ve been discovering your hidden talent for painting! Thanks for your kind words on my teaching, and for investing in the courses. Sounds like everything is falling into place with your new equipment arriving and some eager clients already! Looking forward to hearing how your impressionist painting turns out. It’s amassing the talent you have but more amassing your talent to teach I don’t need to ask questions because you answer all questions on the proses of your painting. I’m going to dig more in you web to find as many tutorial videos as I can find. Thank you very much for the easy and practical way of teaching. You’re welcome, so pleased you’ve been finding the lessons helpful. I have almost no talent … I’ve attended a few “Paint Nites” …but generally have not painted or drawn since kindergarten. I followed along … and I am very very proud of what I painted!! And very enjoyable process. Great video lesson. I am starting the acrylic seashore lesson next! Great to hear you’re proud of your paintings Mike, good luck with the seascape. Thank you so much for such a great tutorial, it’s generous of you and a real life saver for a beginner like me. I took a pic of my painting but wasn’t sure how to attach it. Hi Heather, you can email it through on the contact page. Thank you for making this tutorial available. You obviously have amazing talent. I, however, am new to painting and this set of tutorials has been an amazing guide. I was quite pleasantly surprised to see how my painting turned out. Thanks again! Great to hear it Holly, really pleased you’ve been finding the lessons helpful and are pleased with your results. Just introduced to painting (I’ve just turned 36 years old…) – I am getting so much progress and learning done, watching your exciting videos. Thanks for all the effort and talent. Great to hear it Yuval, so pleased you’re finding them helpful. Will, I LoVe your teaching style and appreciate your FREE videos. I’m currently taking your Beginner’s Acrylic Course and have already learned much. Thank you!! Thanks very much Lori, really pleased you’re enjoying the course. stained glass 1×2 feet slabs a couple of tiffany lamps that were nice to watch, and offered them to family and friends. Ten years ago, I started suffering from Parkinson’s desease. In spite of that I tried to start my stained glass again. I did not succeed, so, I decided to try painting, and the result was not as expected, but I still want to continue painting. Do you think there is achance for me to keep trying ? if its a yes, what do you suggest. Hi Raymond, nice to hear from you, I would just try to create paintings and make them purely for enjoyment. Whenever commerce comes into mind before you start a painting you’ll often be subconsciously changing what you want to paint to what you think you should paint. Try a couple of tutorials, try copying an old master painting, just don’t put too much pressure on yourself. Learning self-compassion to your inner critic is one of the best things you can do to enjoy your painting. Hi Richard, I was using the Golden branded Cobalt Blue hue, but you should still get a similar colour with the Galeria cobalt blue, it might be the white you’re using, I demo with the Golden titanium white and it’s got quite a strong opacity and ability to lighten colours. Hi Vivian, really pleased you’ve been enjoying the Monet videos, I don’t currently have a Van Gogh inspired video but it was on my to-do list! I have all the copies apart from the green you use and the violet, do you know which winsor Newton ones match? Hi Brendan, the Winsor & Newton Artist’s range don’t currently have a close match to the Permanent Green Light, but you could use Permanent Green Light from the W & N Galeria range. For an alternative to Cobalt Violet Hue, you could use Ultramarine violet with a touch of either (ideally) Permanent Rose, or Permanent Alizarin Crimson. As a follow up is there a reason you tend to use golden apart from a few colours? The winsor artist acrylic main selling point is that there is no color shift from Wet to dry which sounds awesome! Hi Brendan, both brands are good, you’ll see me using them both throughout the tutorials. I have just found this tutorial, and I find it fantastic.The only problem is with the green, I use W&N, and they do not have anything similar than this Golden permanent green light. I do not have a reference of Emerald green, so I can’t mix it by myself. Could you help me how to do a quite close green using some of these pigments? Hi Cris, Phthalo Green Blue Shade with a touch of Cadmium Yellow Medium will get you pretty close. Really hope you enjoy the tutorial. You might also find this lesson on painting greens with Phthalo Green of interest. Pleased your painting turned out well Cris. Great work Heather, so pleased you’ve found the tutorials have helped towards your first Impressionist painting, congratulations! I just found your videos and they are great. I just have taken up painting again now that I am an empty nester. Your paints seem thinner than mine – do you typically thin them with water or are the artist quality paints thinner to allow for more of a washed look? Do you suggest using a medium? Looking forward to watching your other videos! Hi Julie, I mainly use heavy body acrylics and dilute them with water for the first few layers. For later layers when working in thin applications of heavy body paint I use an acrylic glazing liquid gloss (from Golden Paints). My pleasure Michael, really pleased you found it helpful. Firstly, thank you so much for posting your videos on line for the public to use. I teach art in a local high school in South Africa. Its so helpful to send the learners to links that will not confuse them. Your material is very helpful. I intend investigating some of your advanced resources to purchase. That’s great to hear Leigh-Ann, so pleased you’ve been finding the tutorials have been helping your students. When you prepared the coloured ground on the Monet style painting the yellow ochre look quite fluid. Is the paint you are using different to that in a tube? I found that it seemed thicker and less easy to apply. Hi Art, yes, I either dilute the paint with water or if you have then available at your local art store you can use a fluid acrylic. Thanks so much as I have an end of year art exam on impressionist landscapes and this has really helped me prepare. That’s brilliant to hear Sarah, really hope the art exam goes well, let’s get an A! I have watched some of your videos and I am very impressed by your work. piece. I’m just an old bloke who loves art but until now have never picked up a brush. I did a bit of charcoal sketching in my younger days, but that’s about it. My pleasure David, so pleased you enjoyed the Monet videos and are feeling inspired to pick up a paintbrush, hope the painting turns out well for you. Hope it goes well C-Marie.